This post is sponsored by RBC InvestEase Inc. All views and opinions expressed represent my own and are based on my own research of the subject matter. It seems that automated robo-advisors are all the hype of the investment world these days. What is a robo-advisor? It’s an online service that automates investing for you and, for the most part, they use low-cost index ETFs/funds for maximum efficiency. As an advocate of index investing, I believe that robo-advisor offerings have merit and can add value for the long-term investor who prefers to be hands off. For example, while index investing can be kept fairly simple by managing a few ETFs, some investors would prefer that someone/something else adjusted their asset allocation on a regular basis (maintaining ratio of equities and bonds). With other robo advisory services out there, the largest bank in Canada has introduced their own robo advisor called RBC InvestEase. 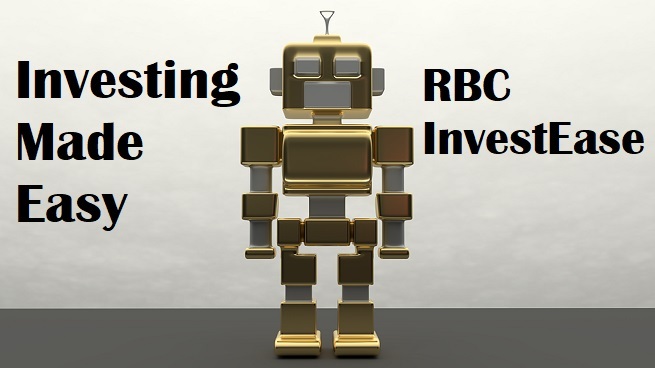 RBC is the latest company to introduce a robo-advisory service and it’s called RBC InvestEase. Like other robo-advisors out there, RBC InvestEase delivers automated investment advice and ongoing portfolio management at a relatively low cost. With this service, RBC InvestEase will do all the work for you. You don’t need to research, buy or sell securities – RBC InvestEase keeps you on track by doing this for you through automatic portfolio rebalancing. Your asset allocation is determined through a questionnaire during registration. The portfolio is overseen by both technology and a team of experts working behind the scenes. In terms of types of accounts, you can open TFSAs, RRSPs, and non-registered investment accounts. As you can imagine, robo-advisors try to make the sign-up process as easy as possible. To get started, go to RBC InvestEase and answer a few questions. From there, you receive an instant portfolio recommendation based on your answers (which is essentially your risk profile and how close you are to retirement). Each suggested ETF portfolio has an asset allocation of equity and/or fixed income that aligns to your investment objectives and risk profile. One comment about these portfolios, no matter how hard I tried, I could not obtain a more aggressive portfolio than the “Growth Portfolio”. Personally, I think 30% fixed income is a little too high for someone who is very young and starting out in their investing journey. To provide a more comprehensive review, I went through the sign-up process to see what kind of portfolio RBC InvestEase would choose for me. To no surprise, after completing the questionnaire about investment knowledge and experience, risk tolerance, income, retirement age, the algorithm decided a “growth portfolio” would be best. Using the online questionnaire, a chart was shown based on the assumption that I place $500,000 in the account with $1,000 in monthly contributions. The result? After about 25 years, the account should have about $3M based on a 6% return. Related: How compound interest can make you rich. While I was skeptical at first on the MERs that RBC ETFs would charge, I was pleasantly surprised that they were very competitive with the largest ETF providers out there. In fact, their website states that their portfolios have a weighted MER of 0.10%-0.17% which is very low – especially for a big bank! Besides the portfolio MER, a robo-advisory service will also charge a fee which is often a percentage of the portfolio size. A number of robo-advisors have a tiered fee based on portfolio size. Typically, the larger the account, the lower the percentage charged. These fees generally range from 0.4%-0.7% depending on portfolio size. RBC has taken the strategy of a fixed percentage regardless of portfolio size. Note that the annual advisory fee does not include the management expense ratio that ETFs charge. Including ETF MERs, portfolios should expect to be charged between 0.60%-0.67% which is reasonable for a managed account. Much lower overall portfolio MER compared to mainstream active management. Clients are forced to use RBC ETFs. While access to outside ETFs would be nice, it’s not necessary as their ETF fees are very competitive with other providers. As previously mentioned, their portfolios lean on the conservative side. This may not be a bad thing for all but may be too conservative for the younger investor. A robo-advisory service is becoming a more accepted way for investors to obtain professional management at a reduced price. RBC InvestEase has introduced a service that will build you a diversified indexed portfolio at a relatively low cost. The major advantage of robo-advisors over indexing a portfolio yourself is that the service will automatically rebalance your portfolio. It’s a completely hands-off solution that will allow investors to utilize a proven low-cost investment strategy. Any thoughts on how these compare to Vanguard’s rather new family of Portfolio ETFs? I’ll need to dig a little deeper into what other value RBC is offering for that annual advisory fee. Hi Steve, if you are a DIY investor, the Vanguard product will essentially do the same thing at a lower cost. However, with the RBC product, you get support if you have any questions/concerns. Depending on the investor, that may be worth the 0.50% annual fee. I was hoping that the spread in fee would cover financial planning, even if very basic, etc. But perhaps that is beyond the scope of the RBC product, as it is definitely not offered via the Vanguard product. My gut it leaning towards trying out the Vanguard products for the next few years. Thanks, and all the best over the holidays and Happy New Year. Next post: Financial Freedom Update (Q4) – December 2018 – Did we Reach our Goal?